"Comes in four different pastel colors, one of which is sure to match your nursery decor." "Perfect for sleepovers, pretend play, car rides, or just snuggling up on the couch." "Little feet can fit all the way down into the shark’s tail, while 'sharp' teeth decorate the top." "Perfect for wrapping up in to watch some ball, whether from the couch or out in the elements." "Offers a sense of security and can simulate the feeling of being hugged." "Ideal for kids whose imaginations run wild." "Makes a stylish addition to any room and is perfect for snuggling up in to watch TV or read a good book." "Featuring some of Marvel’s most powerful heroes, the blanket is up for any job, even if that’s just cozying up on the couch to watch a movie." There’s nothing sweeter than a baby all swaddled up in a cozy blanket. This one is among the coziest and most beautiful baby blankets imaginable. 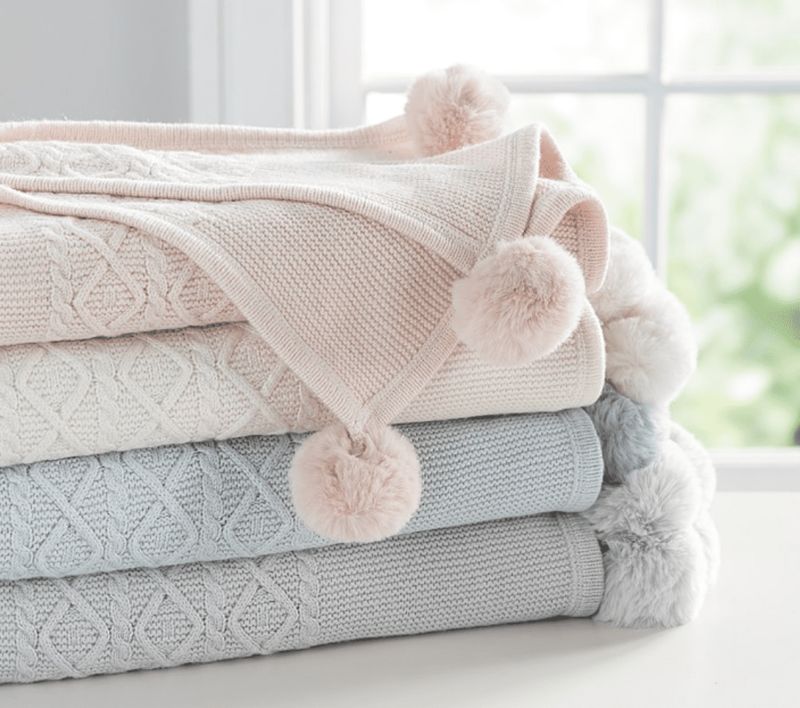 Designed by fashion designer Monique Lhuillier for Pottery Barn Kids, the cable knit blanket features soft, sweet pom poms for a pop of style. Simple in design, it comes in four different pastel colors, one of which is sure to match your nursery decor. This blanket measures 30 by 40 inches, and it can be machine washed on the gentle cycle and tumbled dry on low heat. It’s a gift that will be treasured for years. This mermaid tail blanket from Blankie Tails will make a serious splash with little girls who dream of living under the sea. The minky fabric blanket comes complete with a fin that she can slip into anytime. It’s perfect for sleepovers, pretend play, car rides, or just snuggling up on the couch. The tail measures 56 by 27 inches, and it comes in beautiful rainbow ombre color. The blanket can be machine washed and tumbled dry. The manufacturer recommends that you don’t wash it with zippered items that could snag it. Overall, the quality of this blanket is excellent, and it’s comfortable and fun. For those who prefer a bit more of a ferocious take on things, there’s this super fun shark blanket from Blankie Tails. It puts little guys and girls right in the mouth of danger, in the most adorable way. It’s designed for kids ages 5 to 12 and up to 4 feet, 11 inches. Soft and cozy, little feet can fit all the way down into the shark’s tail, while “sharp” teeth decorate the top. It measures 56 x 27 inches, is available in four fun colors, and is machine-washable. Great for sleepovers, camping, or just lounging about, this blanket makes a great gift that’s both useful and fun. The majority of customers say it’s well made and that their kids flip for it. For the sporty set, there’s The Northwest Company's fleece blanket that’s emblazoned with their favorite NCAA collegiate school. From Alabama to California and everywhere in between, you can choose from all of the schools. Made of 100 percent fleece polyester, it’s warm and soft, yet lightweight. It’s perfect for wrapping up in to watch some ball, whether from the couch or out in the elements. It measures 45 by 60 inches and is machine washable. Great as a graduation gift, customers say the colors are vibrant, and it makes a great decoration as well. While most like the weight of the blanket, some say it’s thinner than they’d like. Some children and teens with anxiety, insomnia, and other conditions may benefit from a weighted blanket. They offer a sense of security and can simulate the feeling of being hugged. This blanket from YnM gets high marks from customers. It comes in a variety of colors and sizes, which should be selected based on your child’s weight; the blanket should weigh approximately 10 percent of their body weight. The weighted liner is made of 100 percent cotton, and it’s filled with glass beads. A duvet cover to fit over it can be purchased separately. 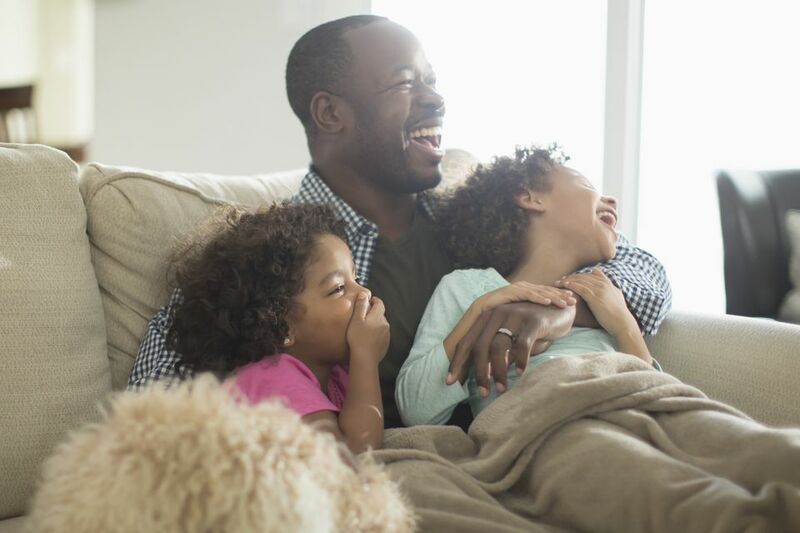 While some report that it can get hot, most customers say they like the weight of the blanket and have seen positive results in their children’s sleep habits as well as their own (it comes in adult sizes too). For a bit of whimsical magic, there’s this Born To Unicorn's unicorn blanket is ideal for kids whose imaginations run wild. Complete with a horn-studded hood and colorful fringe, it will keep them cozy from head to toe. And talk about adorable! It’s perfect for pretend play, but it’s also practical for snuggling up when things get chilly. It measures 40 by 36 inches and can be machine washed on the cool or hand-wash cycle. Customers rave about it and say little ones adore it. It's time to get a little fancier with a fabulous faux-fur throw from Pottery Barn Teen. Fashionable tweens and teens will flip for its fluffy feel and stylish colors. It comes in blush, plume, grey, and ivory, so it's sure to fit any decor. At 45 by 60 inches, it's also an ideal size for curling up and it can be machine washed and dried. This will make a stylish addition to any room and is perfect for snuggling up in to watch TV or read a good book. Pow! Boom! Splat! If they dream of saving the day superhero style, this blanket from S.L. Home Fashions is a super choice. Featuring some of Marvel’s most powerful heroes, the blanket is up for any job, even if that’s just cozying up on the couch to watch a movie. Made of 100 percent fleece polyester, it’s not a thick blanket, but rather a lightweight one that works well when you want just a little bit of extra warmth. It measures 50 by 60 inches and is easy to take to the beach, park, or anywhere else. While some customers say they wish it was a bit thicker, many others say it’s perfect for summer or other occasions when a heavy blanket is too much.